Home / Uncategorized / Hard Hat Tour Party! You’re Invited. 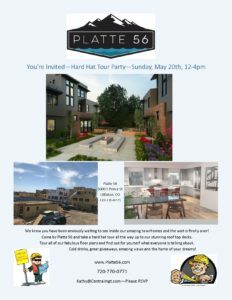 Hard Hat Tour Party, Sunday, May 20th, 12-4 pm. Now is your chance to tour our amazing floor plans all the way up to the 4th story roof top decks. Please RSVP to Kathy@CentralMgt.com or call 720-770-0771.